Louis Pasteur once remarked that “chance favors the prepared mind.” It holds equally true that chance favors the prepared prototype: models and simulations can and should be media to create and capture surprise and serendipity. Yet surprises are not always welcome. So what did AID do in the ugly face of this consistent and politically incorrect outcome? The agency shut down the exercise. In 1946 one of the earliest references to the turbo-encabulator appeared in Time Magazine on, April 15, 1946 by Bernard Salwen, a New York lawyer working in Washington, DC. Part of Salwen’s job was to review technical manuscripts. He was amused by the jargon and wrote the classic description of a non-existent turboencabulator. 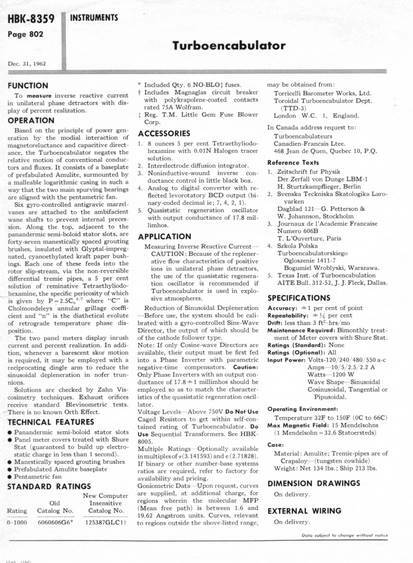 In 1962 a turboencabulator datasheet was created by engineers at General Electric’s Instrument Dept, in West Lynn, Mass. quoting much of the above sources and inserted into the General Electric Handbook. 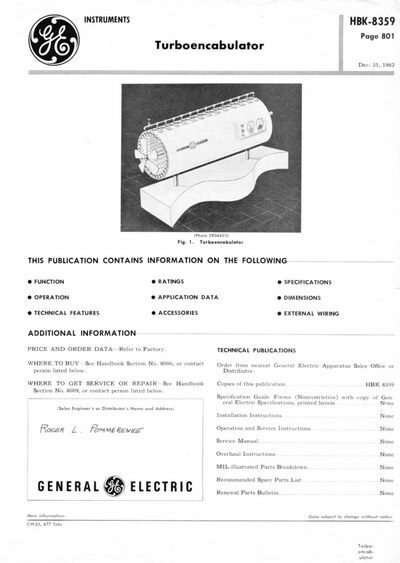 Perhaps to make the hoax more believable, the turboencabulator data sheet had the same format as the other pages in the GE Handbook. And the engineers added “Shure Stat” in “Technical Features” (which was peculiar only to the Instrument Dept.) and included the first known graphic representation of a ‘manufactured’ turboencabulator using parts made at the instrument Dept. Dave Hermansen did not own a bird or a cage when he bought bird-cage.com, an online store, for $US1800 three years ago. He simply saw a website that was “very, very poorly done”, and begged the owners to sell it to him. He then redesigned the site, added advertising and drove up traffic. Last December, he sold it for $US173,000. While there is no data on how many people flip websites, the number of sites sold on eBay has doubled over the past three months, the company says. At SitePoints marketplace, a similar forum where users can auction off websites, sales have quadrupled in the past year, says site founder Matt Mickiewicz. 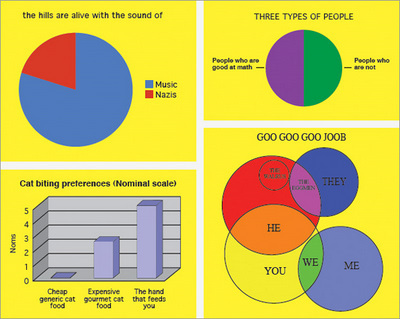 The changing economics of the web have made it easier to find and exploit niche communities on the internet. Building niche websites and small-scale online stores has become cheap and easy. Free software, advertising systems such as Google’s, and “drop shipping” services that allow website owners to handle products through a third-party supplier, have lowered the cost of doing business. Is green U.S. mass transit a big myth? Is green U.S. mass transit a big myth? Yes, Brad Templeton discovers, after pulling numbers from the U.S. government bureau of transportation statistics and the Dept. 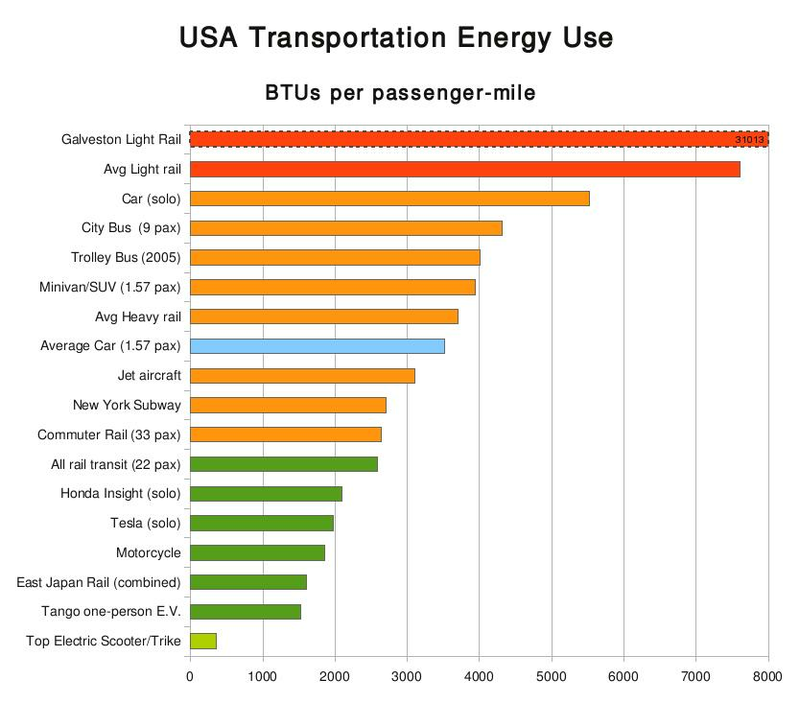 of Energy Transportation Energy Data Book (especially table 2-12). A full bus or trainload of people is more efficient than private cars, sometimes quite a bit more so. But transit systems never consist of nothing but full vehicles. They run most of their day with light loads. The above calculations came from figures citing the average city bus holding 9 passengers, and the average train (light or heavy) holds 22. If that seems low, remember that every packed train at rush hour tends to mean a near empty train returning down the track. 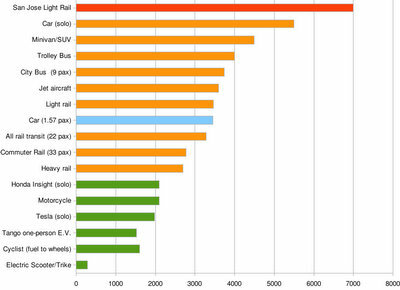 Transit vehicles also tend to stop and start a lot, which eats a lot of energy, even with regenerative braking. 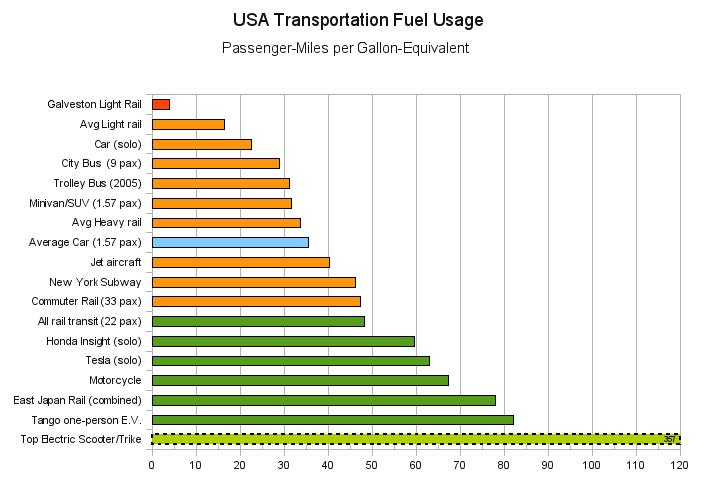 And most transit vehicles are just plain heavy, and not very aerodynamic. Indeed, you’ll see tables in the DoE reports that show that over the past 30 years, private cars have gotten 30% more efficient, while buses have gotten 60% less efficient and trains about 25% worse. The market and government regulations have driven efforts to make cars more efficient, while transit vehicles have actually worsened. In order to get people to ride transit, you must offer frequent service, all day long. They want to know they have the freedom to leave at different times. But that means emptier vehicles outside of rush hour. You’ve all seen those huge empty vehicles go by, you just haven’t thought of how anti-green they were. It would be better if off-hours transit was done by much smaller vehicles, but that implies too much capital cost — no transit agency will buy enough equipment for peak times and then buy a second set of equipment for light demand periods. Transit planning is also driven by different economies. Often transit infrastructure (including vehicles) is paid for by state or federal money, while drivers (but also fuel) are paid from local city budgets. This seems to push local city transit agencies to get bigger vehicles and fewer drivers where they can, since drivers tend to be hired full-time and can’t be kept idling in low-demand periods. In Templeton’s opinion, you should still take transit, because the marginal energy cost of one more transit passenger is much less than the energy cost of one more car, even if the average cost is no lower. Transit fares are highly subsidized. It’s not uncommon for a $1.50 transit ticket to offer a ride that costs the agency 3-4 times as much to provide. (In U.S. big cities, on average subsidies pay for 44% of rail cost and 69% of bus cost. Suburban buses can see almost 90%.) Cars are also subsidized of course, via roads (which also provide subsidy to buses, trucks and street cars, of course) and via free parking and forced parking construction requirements. To the extent that roads are funded by gasoline taxes — which varies from place to place — this is not a subsidy so much as a user fee. 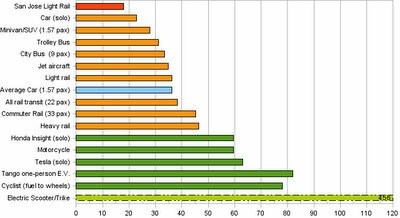 Anyway, Templeton also provides his numbers in MPG-equivalents. The researchers tested two groups of test crews: those who flew the scenario after a minimum of two days off, as if it were the first leg of a three-day trip (preduty) and those who flew the scenario as the last segment of a three-day trip (postduty). The scenario was characterized by poor weather that forced a missed approach to a landing. The missed approach was further complicated by a hydraulic-system failure that created a high-speed, high-workload situation. The two pilots had to select an alternate landing site and manually extend the plane’s gears and flaps while flying an approach at higher-than-normal speed. When the researchers reanalyzed their data, fatigue was found to be a far less statistically significant safety factor than whether the crews had recently flown together. The simulation fidings indicate that crew schedules resulting in frequent mixing of pilot teams can have significant operational implications. The NASA researchers noted that no fewer than three of the wors 1980s-era accidents — a stall under icy conditions, an aborted takeoff that landed the plane in the water, and a runway collison in dense fog — all involved crews paired for the first time. Former vice president Al Gore — who for the past three decades has unsuccessfully attempted to warn humanity of the coming destruction of our planet, only to be mocked and derided by the very people he has tried to save — launched his infant son into space Monday in the faint hope that his only child would reach the safety of another world. 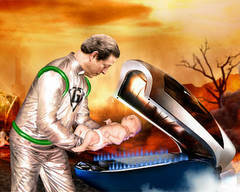 Al Gore — or, as he is known in his own language, Gore-Al — placed his son, Kal-Al, gently in the one-passenger rocket ship, his brow furrowed by the great weight he carried in preserving the sole survivor of humanity’s hubristic folly. You can thank The Onion for that one. Americans today spend almost as much on bandwidth — the capacity to move information — as we do on energy. A family of four likely spends several hundred dollars a month on cellphones, cable television and Internet connections, which is about what we spend on gas and heating oil. Energy efficiency and flexible lighting applications have long been the promise of organic light emitting diodes (OLEDs). The technology hasn’t lived up to its promise, however, because in typical OLEDs, only 20 percent of the light generated is released from the device. That means that most light is trapped inside the bulb, making it highly inefficient. In OLEDs, white light is generated by using electricity to send an electron into nanometer-thick layers of organic materials that behave like semiconductor materials. 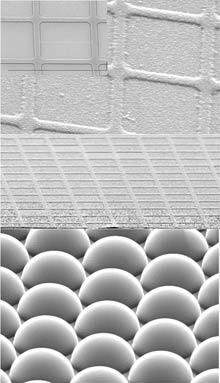 Typically, the light in the substrate is internally reflected and runs parallel and not perpendicular. That’s the crux of the problem because the light can’t escape in the vertical direction without some coaxing. In Forrest’s devices, the grids refract the trapped light, sending it to the five micrometers dome-shaped micro lenses. The light is sent off in a vertical orientation that helps release the trapped rays. Forrest and his coworkers report that the technology emits about 70 lumens from a watt of power. In comparison, incandescent lightbulbs emit 15 lumens per watt. Fluorescent lights put out roughly 90 lumens of light per watt but have liabilities: they produce harsh light, lack longevity, and use environment-damaging substances like mercury. This employee wore a radio headset. Her main job was to go down the line of people waiting to order and ask them what they wanted in advance of their arriving at the cash register. There [at the register], they would be asked to repeat their order before paying and finally joining the line of customers waiting for their drinks to appear. I learned from the website that the woman I had seen in the headset taking orders was officially called an expediter — but the job title is something of a red herring, according to the collective wisdom of the Starbucks staff members chatting on the site. Expediters are not really there to see to it that a customer’s order is filled more quickly, they believe. Rather, expediters exist solely to prevent people in line from giving up and wandering off, maybe to go to the Dunkin’ Donuts around the corner. Once a customer places an order, the logic goes, he or she feels an ethical obligation to wait for it to be filled, no matter how long the process takes. Expediters are there to lock in that order as soon as possible. Between 1870 and 1950, the average American’s level of education rose by 0.8 years per decade. In 1890, the average adult had completed about 8 years of schooling. By 1900, the average American had 8.8 years. By 1910, it was 9.6 years, and by 1960, it was nearly 14 years. [...] Educational levels were rising across the industrialized world, but the U.S. had at least a 35-year advantage on most of Europe. In 1950, no European country enrolled 30 percent of its older teens in full-time secondary school. In the U.S., 70 percent of older teens were in school. Goldin and Katz describe a race between technology and education. The pace of technological change has been surprisingly steady. In periods when educational progress outpaces this change, inequality narrows. The market is flooded with skilled workers, so their wages rise modestly. In periods, like the current one, when educational progress lags behind technological change, inequality widens. The relatively few skilled workers command higher prices, while the many unskilled ones have little bargaining power. This implies to me that a handful of remarkable technologists move us all forward, but more-educated workers capture more of the surplus than unskilled workers. I.Q. matters, but Heckman points to equally important traits that start and then build from those early years: motivation levels, emotional stability, self-control and sociability. It’s not globalization or immigration or computers per se that widen inequality. It’s the skills gap. Boosting educational attainment at the bottom is more promising than trying to reorganize the global economy. How do we “boost educational attainment at the bottom” when educational attainment is “depressingly” easy to predict by age 5? The added thallium doubled the material’s ability to convert heat into electricity by increasing the voltage that it produces. 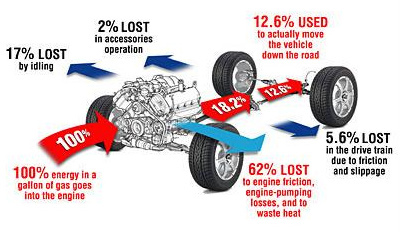 Heremans says that the improved efficiency could translate into a 10 percent increase in the fuel economy of cars if the devices are used to replace alternators in automobiles by generating electricity from the heat in exhaust. Conventional lead telluride thermoelectrics convert about 6 percent of the energy in heat into electricity. Once it’s incorporated into a thermoelectric generator, the more efficient thallium-enhanced material could increase this to 10 percent, once losses, such as those from making electrical connections, are taken into account. One drawback is that thallium is extremely toxic. Anyway, thermoelectrics could increase the fuel economy of cars, because cars waste a lot of energy as heat — almost all of it, in fact. Currently cars use an alternator to transform mechanical energy into electricity — to recharge the battery, etc. — but thermoelectrics could transform some of that wasted heat instead. As entertainment, as art, there is so much to love. I can live with all the politically correct cant: You don’t need to find your father to find yourself! I’m glad I raised my daughter alone, it was better that way. We don’t need no piece of paper from the city hall! (Oh, wait, that was Joni Mitchell — but the sentiment is there, all right.) Isn’t it cute that Colin Firth’s character turns out to be gay? I can live with it because I’ve been numbed. But what I can’t live with is the vile hypocrisy of it. Because, while the dialogue keeps delivering punchy little slogans for the elitist anti-marriage crowd (and all the pro-marriage sentiments are uttered by a naif who, at the end, changes her mind), this movie absolutely depends, for all its emotional interest and impact, on the audience’s innate longing for love and marriage, monogamy and fidelity, babies and nuclear families with a mom and a dad. In other words, they’re having their cake and eating it, too. This movie has no point, it does not work, without the audience’s commitment to the traditional (and, one might even say, culturally necessary) moral worldview. And yet the movie pretends to be post-marriage and post-family. The problem is that while coasting on tradition, Mamma Mia! is normalizing the civilizational deathwish of our current cultural elite. As a social artifact, it isn’t worth scraping off of the bottom of my shoe. I had a wonderful time watching it. One of the dullest low-level tasks in creating software at Microsoft is managing “the daily build,” which is, in practice, a daily prototype of the product in process. The person performing the daily build collects all the code from the programmers on the product team and puts it on a single computer to see if it all works together. For years, this task was performed by an entry-level person and regarded as mind-numbing grunt work. One manager changed that in a way that made the process more efficient and more effective. Instead of delegating the task to a grunt, the manager gave the daily-build responsibilities to the people writing the code. Each day the programmers would give their code to one “buildmeister,” who put it all together. If the code wasn’t compatible, the person whose software “broke the build” became buildmeister as punishment until someone else’s code broke the build. In the summer of 1996, the buildmeister was also given an enormous zucchini — “the zucchini of questionable freshness,” — sometimes with Groucho Marx glasses and a fake nose, to keep until the next buildmeister was named. Delegating the task of buildmesiter to the team changed Microsoft’s daily prototyping process for the better. More developers got to see how their work fit together, or didn’t. No one wanted to be buildmeister, so an extra incentive to hand in quality code was created. What’s more, the unpleasant task of build management was equitably shared by everyone in the group. Accountability, responsibility, and quality were thus aligned. The realignment had other important repercussions. The smartest and savviest high-level software developers hated being buildmeisters and wanted to spend as little time on the task as possible. But instead of weaseling out, they wrote tools to automate the task of buildmeister. The result? Microsoft developrs now manage the build with a fraction of the friction and in a fraction of the time they did in the mid-1990s. I think Burley is missing the point. There’s nothing first-person about being a general; a general gives orders. His job is to get information, usually by talking to people, and make decisions, which has nothing to do with 3D movement.